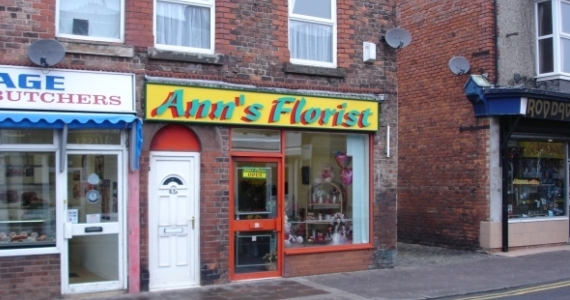 Debbi, the owner of well known Hoylake florists Ann’s Florist has been in touch. She would like to let you all know that the business has moved down Market Street a bit, leaving the old shop where the business has traded for many years. Debbi informs me that faced with a hefty hike in rent she had make the decision to either close the business or downsize. Choosing the latter option, Debbi has moved the business to a vacant shop next door to Bill Page Butchers. I wonder how long the old premises will remain vacant? Regular reader Sue seems to remember that the shop pictured above used to Knowles Chemist a few years ago. That vaguely rings a bell with me too. Can anyone confirm that? The recently closed sweet shop that was there didn’t last long did it? And down that alley way is Jones The Chain …can anyone enlighten me about that business?? Jones the Chain used the garage at the back of Knowles Chemist for his workshop and sold Paraffin and Calor Gas to the Locals also Chain for the Boat Owners locally. He actually put the Chain down for my Husbands Moorings by Sandhey Slip. He worked at Cammell |Lairds. I have found all the Press Cuttings etc for Hoylake Pool and Community Hall, knew Peter Wilson and Gail Rochford and her Mum well as I was Secretary of the Trust. If you look at the photo of the previous location for Ann’s shop, you can see two white plaques on the first floor wall. These are pictures of cows! The old shop was originally a dairy. Dodds Shoe Repairs was next door to Sue’s Florists, the other side of the passage way, where the Video shop is now. Before the Antique shop and the school as I remember.